Pro Data Doctor offers financial accounting software (enterprise edition) with advance barcode feature for easily managing accounting records of the company in accurate manner. Fast and flexible accounting management software is full fledge business transaction management tool that provides the general information of customer and vendor records, inventory records, stock status information, sale/purchase order and other accounting records for end to end business accounting management. Easy to use invoicing and inventory management software facilitates with barcode settings which is helpful to save time and effort by avoiding manual data entry process. After enabling the barcode setting all the barcode related information will be activated and you can use this facility for managing entire accounting system accurately with error free. Award winning bookkeeping management software provides facility to review total financial transaction in financial year by maintaining various accounting reports. Data Doctor's professional financial accounting software with enterprise editions enables you to extract relevant information of the company's account for business growth. Easily manages business accounting records in accurate manner. Facilitate with barcode setting for higher level of data security. Computerized accounting software maintains customer/vendor records, company records, stock information, sale/purchase record and other bookkeeping records without manual data entry process. Facilitate to generate various business accounting reports including balance sheet, trial balance, profit & loss report, cash book, bank book, production report, stock report and more. Facilitate with user settings and administrator settings for secure account maintenance. Facilitate to take backup and restore the data for further use. Facilitate with data connectivity feature to fetch the accounting records from other inter connected computers. Advance accounting software supports various barcode fonts including Code 39. Code 93, Codabar, Code 128, Interleaved 25, MSI Plessey, Onecode, Planet, Postnet, UCC128 to access error free accounting information. 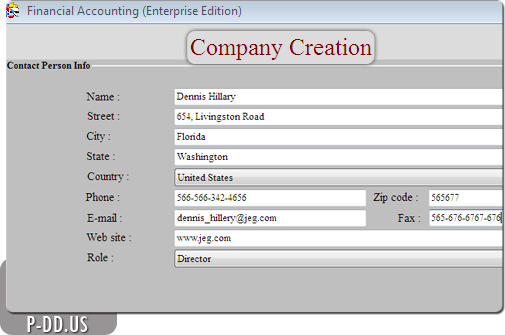 Accounting software does not allow the duplicacy of accounting records. Easy to use and user friendly accounting software facilitates with systematic user guide for further assist.